Whichever way you look at it power lines are an ugly and unsightly necessity of life. But Choi and Shine Architects based in The Boston have devised an ingenious way to make these eyesores beautiful and elegant. Their human pylons alter with the landscape so that when the electrical lines ascend a hill, the pylon figures imitate a climbing person. The pylon-figures can also be placed in pairs, walking side by side or glancing at each other or holding hands. I’m not big on financial news, but this story is doing the rounds at the moment and it caught my eye. The Chinese government have built a brand new city in Mongolia called Ordos in just five years. This city has skyscrpaers, housing, concert halls everything a western city would have except one thing…people. The city has no residents. Why? Because it is just too expensive for the average man on the street. This purpose built city is less than 20 miles from the original Ordos city, which the government felt was too rundown, so they built a new one. The result is they built a shiny new city which is too expensive for anyone to afford and so the whole population still live in the rundown city next door. Madness here. Benedict Redgrove is a fantastic car and architectural photographer, who creates beautifully composed shots of car factories and buildings (funny that). Check out the pages and pages of his work here. 3d building projections are all the rage. Some quite amazing stuff here. Enter the weird world of Tim Hunkin. This engineer/comedian/cartoonist has contraptions and machines for every useless thing you can imagine. One of the highlights has got to “Fly drive”. A fly simulator where you ar ethe fly and have to eat as much as you can before you get twatted. Loads of fun here. If you’ve got a spare 4 years of life knocking about, you might just be thinking I’m gonna build a huge paper house, right? No. Well an art student from Tokyo has been working on this project painstakingly for four years and has now competed his masterpiece complete with turning ferris wheel, lights and a train. The only problem is that the walls are paper thin. He he he. Admittedly, it does look amazing, but just think of how many hours of grand theft auto Mr Itou has missed out on (see post below). Not so plain paper here. Wat Pa Maha Kaew Temple is the only temple in the world build out of glass bottles and bottle caps. 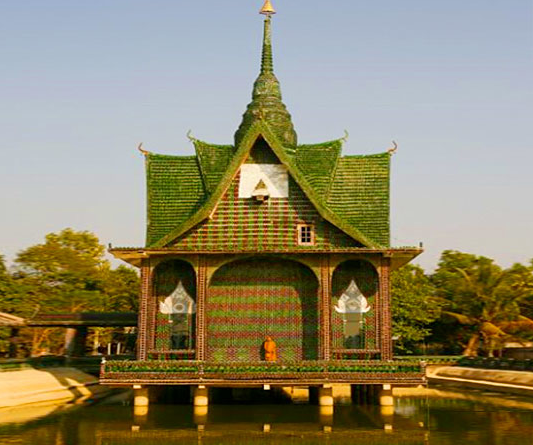 It all began in 1984 when the Buddhist monks started gathering bottles to decorate their shelters. The lovely bottle art-work they created attracted more and more visitors that began donating bottles, until there were enough to build an entire building. Continuing the thread on stupid people. We now have Joanne Ussery, a hairdresser, who was looking for a new mobile home to put next to the lake. When her brother-in-law, an air traffic controller, had an unorthodox suggestion. Of course, why not use one of the planes that are sat on the runway as a house. She paid $2,000 for the 727 fuselage, which seams pretty cheap. $4,000 for a house-moving company to move it to her lot, and six months and $25,000 to renovate it. Nutter. Read the whole story here. A 16-year-old German freek, nicknamed FrooP, has spent all of his free time building a bizarre project instead of going out and meeting girls. FrooP started building the Chernobyl-themed PC from scratch, adding an impressive flip open panel to view the meltdown inside. Nutter. Check out more of his handy work here.